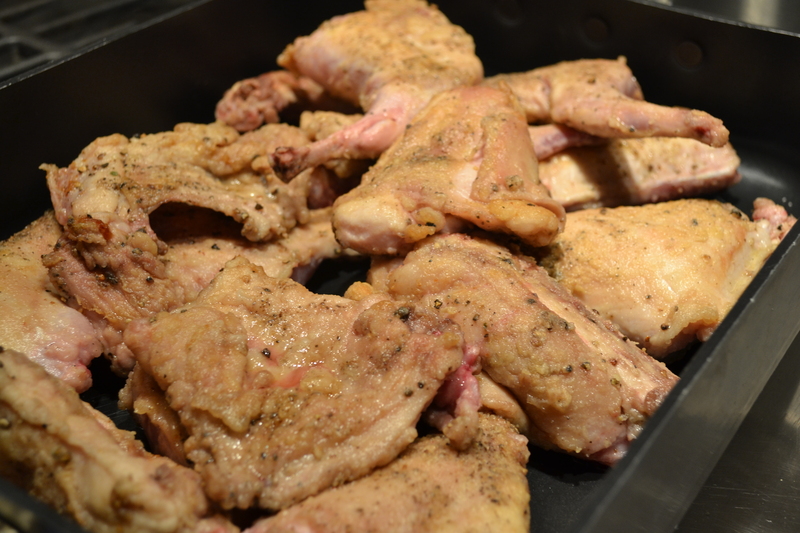 For the first time ever, I cooked (and ate) rabbit. I was very excited about it. Even though it was farm-raised and not wild rabbit it gave me a starting point. I’ve cooked venison, wild pork, elk, salmon, halibut, pheasant, white-wing dove, and rock dove. It was time to add rabbit to my repertoire. I’m looking forward to experimenting with recipes that incorporate the subtle flavor. While, at this point, I still haven’t used wild rabbit, I’ll keep everyone updated once I have. I’d love to get my readers’ input and experience with rabbit, wild and farm-raised. This was two farmed-raised rabbits. They fed 6-8 people. For some, rabbit just isn’t their “thang”. 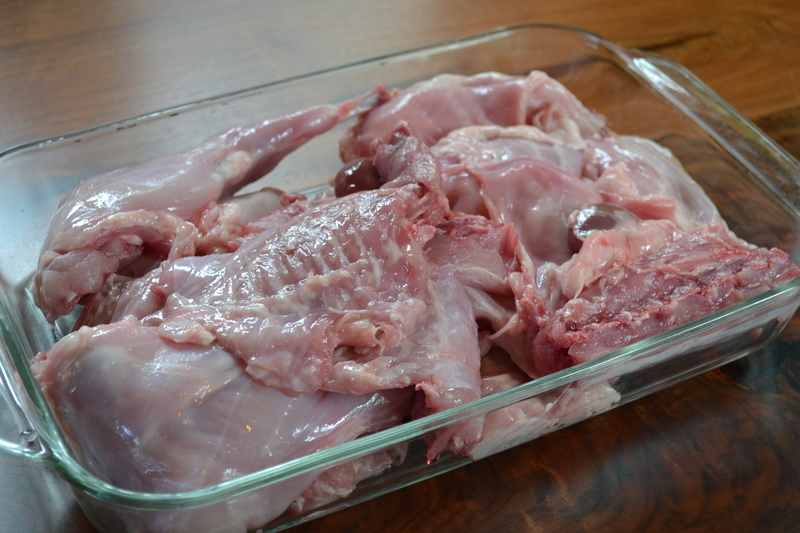 Cut rabbit into about 4 or 5 pieces, two legs, two fore quarters, and ribs, depending on the size. Season liberally with kosher salt and fresh ground pepper. Dredge in flour. 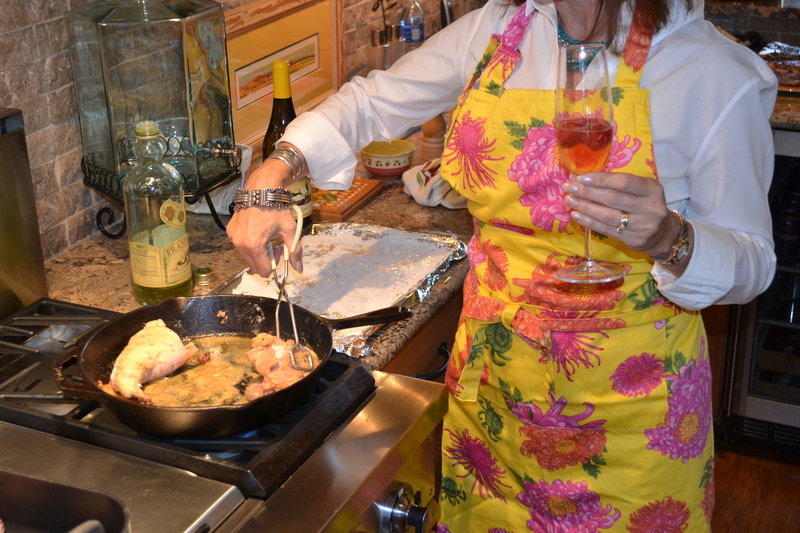 Wine glass and flamboyant apron are NOT optional! It’s all part of the total package! In a cast iron roasting pan, melt about 2 tbsp. of butter. Brown rabbit on all sides. Place on a separate plate. 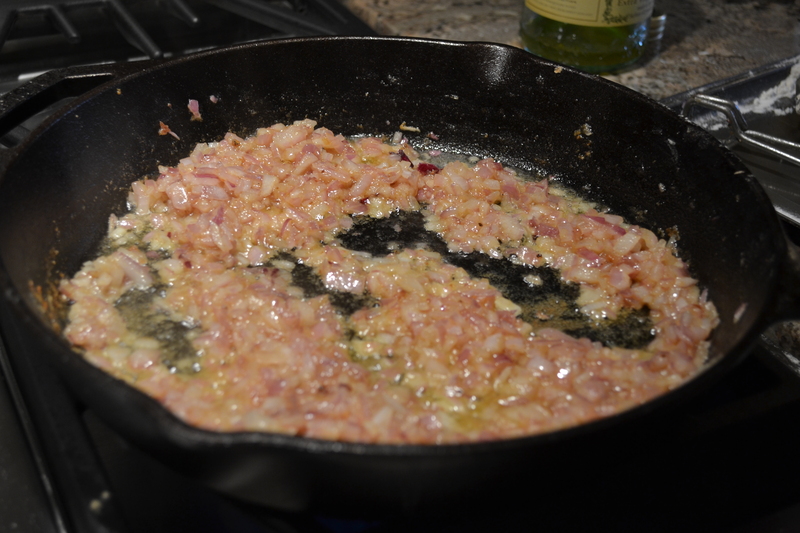 Add onion to pan and sauté until translucent, scraping up yummy browned bits. 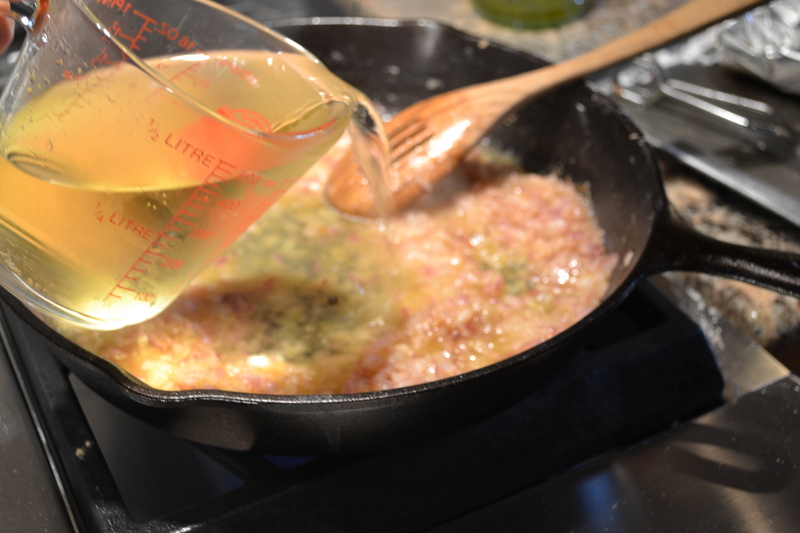 Deglaze with a splash of cognac, continuing to scrape up bits. Add wine and chopped sage. Return rabbit to the pan. Add enough stock to cover. Bring to a boil. Add olives. Reduce heat, cover. Simmer for 2 to 3 hours until meat is tender and sauce is thickened and reduced. Add sage leaves after plating. Serves 2-3. I have yet to eat rabbit. But my grandma on my mom’s talked about her mother making rabbit for Sunday dinner. I’m personally pretty afraid to try wild rabbit (Tularemia sounds, uh, bad), but I’d definitely try domesticated farmed rabbit. When I was a child, we raised rabbits for meat. I’ve never had it like this though! Looks wonderful. I am looking to get rabbits in the spring. 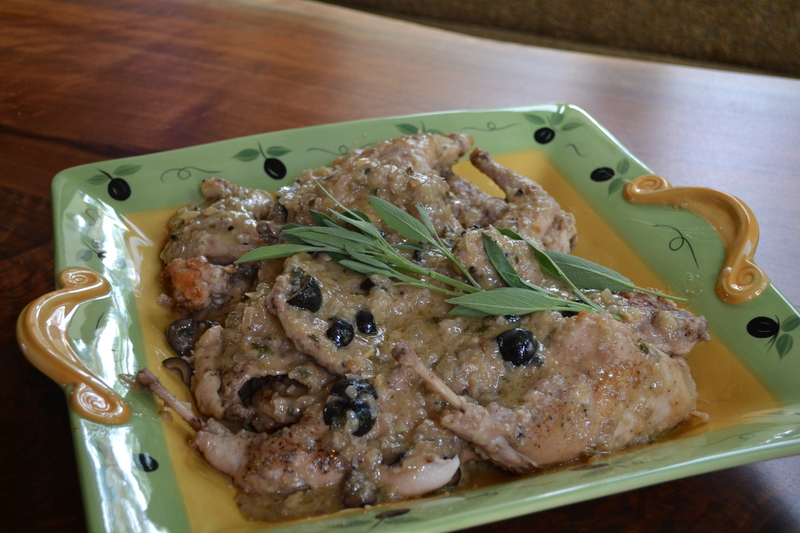 We’ve done the wild rabbit thing too, but farm-raised is the best.